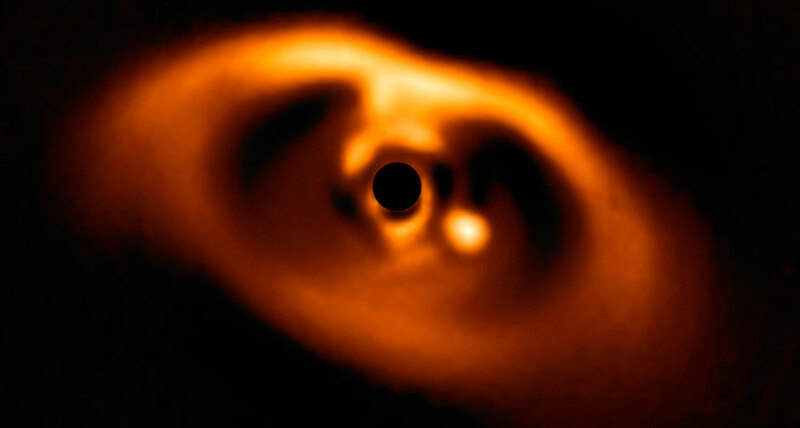 GATHERING DUST Images taken by the Very Large Telescope unveil a still-forming exoplanet in the disk of gas and dust around a star about 370 light-years away. The exoplanet (seen here as a bright splotch to the right of its host star, whose light has been blocked out) is a cloudy world several times more massive than Jupiter. Behold, the sharpest view yet of a planet-in-progress. New infrared telescope observations reveal an exoplanet that appears to be growing inside the disk of gas and dust around a star about 370 light-years away. Astronomers have indirectly identified other exoplanet embryos by observing the paths that these young worlds cleared through the dusty disks around their parent stars (SN Online: 11/6/14). But pictures released July 2 of the newly discovered exoplanet, dubbed PDS 70b, give the first clear visual of a still-forming exoplanet itself, seen as a bright splotch of light off to the side of its host star. This exoplanet-in-the-making, described in a pair of papers accepted to Astronomy & Astrophysics, could provide new testing ground for theories of planet formation (SN: 5/12/18, p. 28). Miriam Keppler, an astronomer at the Max Planck Institute for Astronomy in Heidelberg, Germany, and colleagues spotted PDS 70b using the Very Large Telescope in Chile. These observations revealed PDS 70b to be a giant, cloudy world about as far from its host star as Uranus is from the sun, but there’s still much we don’t know about the planet. It could be as cool as 730° Celsius or as hot as 1330° C, and its mass could be anywhere from twice to 17 times that of Jupiter. PDS 70b has blazed a trail through the disk of planet-making material around its star by packing on the gas and dust in its orbital path. PDS 70b’s position inside this empty track, as well as the young age of its star — just 5.4 million years old — indicate that the planet isn’t finished forming, Keppler says.